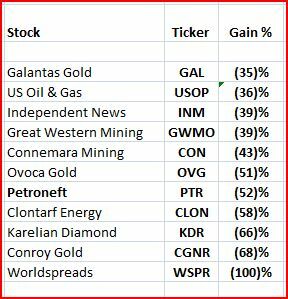 Two exceptions to note: I only added Fastnet Oil & Gas (FAST:LN) (only listed in June, as a result of a RTO/Placing) and US Oil & Gas (USOP) (suspended since 2011, only re-listed on GXG in April) to TGISVP v recently. Therefore, in a similar fashion, I’m only tracking their post-write-up performance – not surprisingly, FAST has barely moved since. USOP, on the other hand, has already demonstrated (again) just how amazing it is – it’s managed an impressive 36% (dead) swan dive (a whopping $146 mio loss in market cap) in the past 2 1/2 weeks, since my post… Wow! Aer Lingus (AERL:ID) would be loathe to admit it might actually be ‘enjoying‘ Ryanair’s (RYA:ID) attentions, in the form of another attempted takeover bid – this should run & run (again)..! Intrinsic value still looks significantly higher for AERL – recent hints/steps to distribute surplus cash to shareholders should help with potential value realization. However, I’d be none too surprised if any eventual distribution strategy/announcement is accompanied by some huge pension deficit concession to the unions (despite AERL’s repeated denials of any legal liability). Prime Active Capital (PACC:ID) is a bit of an outlier. Its YTD gain appears to be more down to a volatile price & a wide spread, than any fundamental share price gain. Its news-flow/results certainly haven’t been promising recently, but it remains (vaguely) intriguing as it potentially has a much higher intrinsic value in a sale situation. Then again, who on earth wants to buy shares in an Irish company invested in cell phone stores located in places like Alabama & Pittsburgh…?! 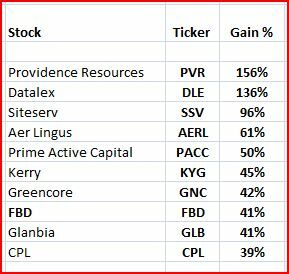 The rest of the Top 10 (with the exception of CPL (CPL:ID), which still has more room to run) appear to reflect a continued flight/re-allocation to safety – in the form of some of Ireland’s major agri-businesses, and FBD Holdings (FBD:ID) (which I hold) with its now fully de-risked balance sheet. Yeah, that sounds about right – case closed!